CARMEL, IN – The thirteenth annual Tour de Carmel will be held on September 17th, 2017. This year’s ride will be approximately 8 miles long utilizing multi-use paths, trails and sidewalks. The bike ride will start at 10am. The ride will finish at the festival at City Center where riders may purchase food and beverages as well as take part in the Recovery Tent and enjoy live music. The registration fee is $20 per person and a portion of it will be donated back to the Carmel Parks Foundation. With your registration, you will receive a bright and reflective back pack…perfect for young and old. There is early registration but the online registration will cut off September 16th at 5 PM. You will be able to register the day of too. For more information on the event or sponsorship, contact Chris Tanner at 317-414-8289 or christinetanner01@gmail.com. (May 1, 2017 - Carmel, Ind.) – Carmel Clay Parks & Recreation (CCPR) and Rollfast have entered into an agreement to collaboratively present the 13th annual Tour de Carmel, scheduled for September 17, 2017. This year’s event will serve as a transition year as Tour de Carmel migrates from a CCPR event to Rollfast Gran Fondo in 2018. This year’s ride will be approximately 5 miles long (an addition to Rollfast’s offering 25/65/100-mile ride offerings) utilizing multi-use paths, trails and sidewalks. The bike ride will start at 10 a.m. and finishes at the Rollfast Gran Fondo festival where riders may purchase food and beverages as well as take part in the Recovery Tent and enjoy live music. Rollfast will be working alongside CCPR concerning funding, advertising and event-planning, providing each other with resources to ensure a successful transition. Rollfast, soon to become the main contact for the Tour de Carmel, will be donating $1 of each registration for the 2017 five mile ride to the Carmel Parks Foundation. For more information on the event or sponsorship, visit http://www.rollfastcycling.com/ or contact Rollfast founders Matt and Chris Tanner at 317-281-8479 or rollfastfondo@gmail.com. Spend just 20 minutes with Rollfast CEO Matt Tanner, and you'll understand me when I say that the sport of cycling absolutely consumes the man. Not that that's a bad thing, especially when you're running a nonprofit dedicated to promoting better health through cycling, and providing training opportunities for young, promising Indiana cyclists. When I met with Matt a few weeks ago at a local cafe, it wasn't hard to spot him, decked out in his Rollfast cycling kit, geared up to head out on an hour-or-so-long ride on the Monon Trail. (I'd found him on a “rest” day.) “My coach, Tom Danielson, sends me a week-long training plan, which we adjust as goals are met or not met,” Matt explains in answer to my question about his training regimen. “Yesterday, I did a two-hour ride with some pretty intense intervals, called VO2 max—so it's like giving maximum effort for four minutes, then resting—it was a 40- mile ride, a typical day.” Matt's training right now for the Indiana State Time Trial, coming up in mid-August. After that, he says, his time will be devoted almost exclusively to the Rollfast Gran Fondo, the organization's most high-profile fundraiser and community building event of the year. I found it a little hard at first to get a man so completely devoted to the sport of cycling to talk about his past life as a web designer. But a little perseverance paid off. “I studied computer graphics at Purdue, and when I graduated I was on the very front-edge of Internet web development,” Matt says. He worked for about 15 years, doing web design and development, and for the first several years, Matt took pride in being one of the few people who understood both the graphic design and coding aspects of building web sites. “It was really cool to be doing something no one else was doing, and for a couple of big clients.” But as time marched on, and coding became more and more accessible to anyone with the interest and some basic aptitude for it, the thrill of being on that cutting-edge wore off. “By the time I met my wife, Chris, the romance with web design was over, so to speak.” And so Chris floated an idea by him: Why not quit and put his mind to use doing something he was passionate about? In 2012, as crazy as Matt thought the idea was at first, he finally decided to take that leap, leaving behind his web development career and opening the door to a rich, new life—one that would promote cycling and ultimately give back to the community around him. In December 2015, Rollfast took yet another step towards creating a cycling legacy here in Indiana. “There's a terrible opportunity gap for many young cyclists to make the transition from a recreational rider to a competitive cyclist,” Matt says. He points to myriad difficulties for would-be pro cyclists. For one, there are only 23 high school cycling clubs— none in Indiana—registered with USA Cycling in the U.S. And for those lucky enough to live near one, there's the cost of equipment to consider. Matt knew it was time to carry the Rollfast mission to a higher level. “Last year, Rollfast filed to become a non-profit with the goal of creating grants and scholarships for youth in the area to pursue their cycling dreams,” Matt says. “For instance, earlier this year, we connected a junior cyclist in Zionsville to Tom Danielson.” Pro cyclist Tom Danielson, whose name you might recognize as Matt's coach, has competed in the Tour de France, Giro d'Italia, and Tour of California— and he won the Tour of Utah in 2013 and 2014. He worked with the Zionsville youth at a camp Danielson runs, Cinch Cycling Camp, and was so impressed with his cycling that he coached him for another four weeks after camp was over. The young cyclist will compete at the junior level in 2016 and aspires toward a pro contract. Matt also tells me that Rollfast granted their first scholarship to a local cyclist this summer so that he could race in Canada at the Tour de L'Abitibi, the only North American stop on the UCI Juniors National Cup circuit. The goal for Rollfast in this first year of their non-profit status is to provide four scholarships—and Matt emphasizes the role community support must play in achieving this goal. “We need donors to help fund these scholarships,” Matt says, “and we need help spreading the word to kids that cycling is a sport in which they can participate.” What does the future hold for Rollfast? Matt doesn't know for sure. “We may now be a non-profit, but it's still all about the bikes,” he says. “I love that.” And although he can't predict where Rollfast will roll on to next, Matt knows it will revolve around bikes and youth. “Ten years from now, I see Rollfast in many different cities and giving out thousands of dollars to kids who just want to ride their bike.” It really is all about the bikes, after all. July 13, 2016 – Jacob Hoggard will race in Tour de l’Abitibi Desjardins from July 18-24, 2016, in Rouyn-Noranda, Quebec, Canada. Carmel, Indiana, based Rollfast has agreed to provide $1,000 in sponsorship to the up and coming rider. His debut in Abitibi will shine an international spotlight on his talent and the larger pool of world class cyclists living and training in Indiana. Abitibi is the only North American stop on the prestigious UCI Juniors Nations cup circuit. Comprised of seven stages—all of which take place in Europe except Abitibi—the Juniors Nations Cup is an international road cycling race that draws thousands of participants from 40 countries. The 2016 event is.the 46th annual. Hoggard is a Carmel native who has been racing since 2013. He began his career riding for the Rollfast Cycling Club. He currently races for First Internet Bank, whose colors he will carry to Canada later this month. The contribution Rollfast teammates made to his training and ability to compete at this level are undeniable. The Rollfast Cycling Club has trained with World Tour cyclists George Hincapie, Tom Danielson, Christian Vande Velde, and others. “From the moment I met Matt, he and the Rollfast crew supported me in every step of my racing career. After being invited to race in the Tour de l’Abitibi, I was thrilled to earn the Rollfast scholarship. It will allow me to compete with the best racers, on an international stage,” said Hoggard. On Wednesday, July 13, Carmel Mayor James Brainard and Councilman Bruce Kimball participated in a check presentation with the Hoggard family and Tanner at The Bikeline at Carmel City Center. Hoggard is one of several Indiana riders to compete in the Abitibi. Thomas Revard, son of The Bike Line co-owner Bill Revard and current Marian University rider, competed twice. As part of its fundraising activities, Rollfast hosts a Gran Fondo cycling event. This year’s ride is September 18, 2016, and will feature Bob Roll and Tom Danielson. The 48th edition of the Tour de l’Abitibi will take place from July 18th to 24th, 2016 in Rouyn-Noranda. Taking place over a week, several arrivals and departures are scheduled at different locations in the region to make the yearly participating 180 cyclists enjoy an unforgettable experience. Sanctioned by the International Cycling Union (UCI), the Tour de l’Abitibi Desjardins is the only one out of the 7 competitions of the UCI Juniors Nations Cup circuit to be presented outside of Europe. Overall, more than 25 teams throughout the world are coming together in the hope of completing the 7 stages, for a total distance of 600 km in 6 days. For more information visit http://tourabitibi.com/en/. February 19, 2016 -- Rollfast has made an introduction of a lifetime to pro cyclist Tom Danielson (aka Tommy D) for local junior cyclist Spencer Miller. While in Tucson Arizona at the Cinch Cycling Camp, Tom Danielson saw the potential and asked him to stay for a few more weeks to train. "It's been a great experience so far working with Spencer,” said Tom Danielson. 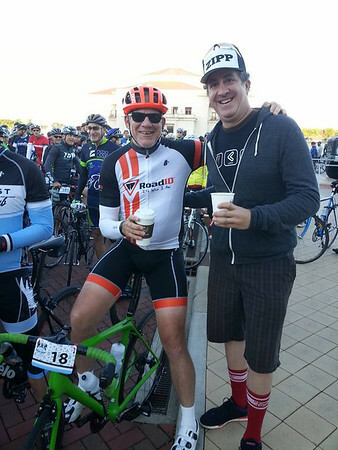 “I met him as he was a guest at the Cinch Cycling Camp with the Rollfast group. After a few rides I could see he had immense talent and watched him progress greatly throughout the week. I really enjoyed working one on one with Spencer and that inspired me to start a personalized coaching component to the Cinch Cycling business. In the four short weeks I have seen Spencer already increase his power greatly and last week he finished high up in the Valley of the Sun race. I believe Spencer has what it takes to make it to the World Tour and at Cinch Cycling we are motivated to help him get there." We are rolling out our new theme for 2016. The message is "The Century of a Lifetime". Our design was created by Lars Lawson at Timber Design Co. The design shows a cyclist ticking off the miles on the way to 100. Highlighted in the design are the other route options at 25 and 65 miles. Our theme for 2016 is intended to be more inviting to ALL cyclists including families that would like to experience the thrill of a Fondo. This years theme will be seen around Central Indiana on posters as well as in some local media advertising. If you would like a poster to display at your home, office, church or school just email us and we'll get one shipped out to you. Clearly we've been busy in the land of Illustrator and Photoshop. We've also been up late at night doing some coding. The Rollfast Gran Fondo website has taken a major upgrade. For all you techies out there, we now have a responsive site featuring parallax elements! If you haven't seen it yet, head over to www.rollfastfondo.com and take a look. Let us know if you like it or if you see any problems! We are still working a few bugs out as expected. No longer do you only have scholarships for football, basketball and baseball. Rollfast is closing the mainstream sports gap by offering scholarships to students to further their cycling dreams. Rollfast is a 501(c)(3) organization with a mission to enhance wellness by promoting bicycling as a means to good mental and physical health by producing events that also create opportunities for the youth of Indiana. Rollfast is organized as a public benefit corporation exclusively for the following charitable purposes, including the making of distributions to organizations a) promoting health and physical fitness; b) promoting and raising funds for training programs for bicycle skills, fitness and safety, junior rider development, sponsoring charitable community bicycle events. Bobke had so much fun riding with us last year he's coming back in 2016! If you got a chance to meet Bob last year you know what an incredibly fun guy he is. If you are a Bobke Superfan, don't miss the return of the Platinum Party. The Platinum Party will be held the night before the Fondo (Sept 17th) from 7-10pm at The Bike Line Carmel. Once again, we'll have a few hours of cocktails and light food while you get a chance to mingle one on one with Mr. Roll. Then we'll end the night with your own personal "Ask Bobke". Get an inside view of what it's like being a pro cyclist and living behind the camera with the likes of Phil, Paul, Christian Vande Velde and Jens Voight. The Platinum Party is LIMITED TO 35 GUESTS. It will sell out. We've gone through some growth over the last 4 years and we are happy to announce that we have partnered with CCN Bikes and their registration platform. Their streamlined registration system has enabled us to raise funds for World Bicycle Relief! Rollfast was recently approached by pro cyclist Tom Danielson aka "Tommy D" to help out with some design work. The job entailed creating a brand for his new cycling camp named "CINCH". The philosophy behind the new company is that things can be broken down into simple accomplish able tasks making the end result a "CINCH". As all great designers experience, the ideas were swirling around when the vision of a mark came to the forefront while in the shower. A letter "C" with the symbol for measurement in inches inside it. It was simple, just like the philosophy of the camps. Not only was it simple, it was somewhat cryptic and in Tom's words "It was BALLER". After the mark was created, several color variations produced. Tom was looking for something that isn't out there yet. Trendy, but not over played. We landed on a variation of greens and brown with classic black and white. Once the mark was approved, we transferred it into a simple design on Castelli kits for production. Hats and kits are on order and soon you'll be able to purchase them online. I first met Christian Vande Velde while riding up Alp d'Huez a few days after he crashed out of his final Tour de France. We rode together for about 30 minutes up the famous cycling route and talked about bikes and riding and what was happening in the tour. He came off as a "normal dude" although, he had a loose screw in his shoulder, road rash and was pumping out 350 watts leisurely up the mountain while I was gasping for air to keep up. We met again at George Hincapie's house during the Hincapie Gran Fondo. George had invited my wife and I over to hang out at the pool and meet some people. When Christian walked in I had to tell him about our ride and he said "Oh yeah! I remember that!" then gave me a pound and hug like we were bros from high school. From that moment I knew we were going to have some fun. Over Memorial Day weekend, my wife and I invited Christian and his wife Leah down to go to Carb Day and do some cycling. Carb day was a new experience for them both and they couldn't believe the size of the track. Christian shared stories of racing at Major Taylor Velodrome as a youth and told us the stories of how he almost went to Marian University. Saturday morning, Christian and I drove over to the CIBA ride (Tour of Three Counties, hosted by Tom and Laurie Schmacher) unannounced. Christian didn't want to create a fuss about him being there. When we arrived, he couldn't believe how many people showed up. "You guys have group rides like this all the time??!?" I had told a few of the juniors in our club to make sure and come out because I had a surprise for them. One of our riders (Spencer Miller) was in awe and fought hard all day to stay with the front group as close to VDV as possible. A few times on the ride there were gaps developing and Christian would grab Spencer by the saddle and power him back to the front. We stopped at one of the rest areas at about 45 miles and again, Christian was floored. "You guys have rest stops with killer food too!?" - Yep, that's how we roll in Indiana with CIBA rides Christian! I wasn't aware, but the entire ride, Christian had been talking to our juniors and other riders on the group. He told Spencer at the end he was going to launch a massive attack and lead out. Spencer was super excited. As we headed up Lafayette Rd towards Fishback school, Spencer went FLYING by me at about 30mph. I laughed and yelled "GO SPENCER!!!". I looked over my shoulder and Christian was smiling and stood up and jammed the pedals back up to him. We rolled into the parking lot and got together for a group photo. Christian told one of our riders that he hasn't ridden that fast in about a year. It was a fabulous weekend with a great CIBA ride to cap it off. 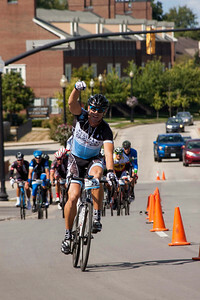 If you missed it, you can ride with Christian again at the Rollfast Gran Fondo, September 14th in Carmel Indiana. A gaggle of Rollfast Cyclists (17 in all) gathered at Rollfast headquarters in frigid Carmel, IN at 6 AM to load up the Rollfast deluxe trailer with our faithful steads. We were going in search of better weather, lumpier roads and adventure. Fueled by Matt’s finely brewed coffee we set off for the mountains of North and South Carolina. We set off in the chilled air. We were delayed by a few flat tires, but undeterred we pressed on toward Skyuka Mountain Road. We were heading for the mountains, some of us for the first time. PAIN. That is what I felt climbing up Skyuka. Skyuka is steep and 5.4 miles long. For a shlub like me that is a challenge. Pain….but what fun! I enjoyed the beautiful scenery and the challenge. I also enjoyed seeing the junior riders charging up their first real mountain! After some rollers our next challenge was Green River Cove Road. 2.4 miles and 17 switchbacks of cycling nirvana. At the end of the day I had ridden 70 miles and climbed 6,700 feet. I was tired when we returned to the cabin. OK, I was destroyed. However after a shower, 30 minutes in the NormaTec boots, and excellent cuisine, I felt…almost normal. Refueled by Chris (Rollfast owner and chef supreme) we were in for a special treat. We assembled at the base of Paris Mountain for a rendezvous with George and Rich Hincapie. Also joining us were some of the Hincapie Development riders. George gave the order to do a quick warm-up (100 meter U-Turn) and then attack Paris Mountain. My stiff legs were displeased with this plan but when a Tour de France stage winner says go, you GO. What a thrill to set a PR on a climb I’ve done numerous times with Big George waiting for me at the top! We then had the thrill of riding with George, Rich and their young riders on George’s ‘secret’ roads. The scenery was great and the roads challenging. The highlight for me was hitting the Watershed climb at the front and stringing it out for the group, then pulling off and watching George, the Devo riders, and my teammates attack the climb. As I worked my way up the climb I thought of the privilege of riding in this setting with this collection of teammates and world class cyclists. My thoughts went four weeks back in the past. I was lying in a bed in a heart hospital with patients dying around me. Grinding up the climb I couldn’t get the smile off of my face and the feeling that I am one fortunate shlub! After finishing the Watershed climb I headed back to George’s hotel and restaurant with a few teammates while some of the stronger Rollfast riders continued on with George for some bonus climbing. We all regrouped for a fantastic lunch and camaraderie at Restaurant 17. George was gracious enough to spend some more time with us as we admired his hotel grounds. From the hotel we cruised the 20 miles back to the Rollfast trailer-less aerodynamic due to the huge smiles we all had. While I relaxed at the trailer and reminisced with some teammates about the fantastic day, a number of the Rollfast mountain goats hit Paris Mountain for a second time. BALLERS. 45 degrees and raining. What should we do? Ride! We decided to keep the ride short and hit a coffee shop. All told we rode 22 miles with 2,000 feet of climbing in cold, soaking wet conditions. The looks on the faces of the people in the coffee shop as we walked in from the gloom was PRICELESS. Saluda Grade is a great climb and I enjoyed climbing it (helped raise my core temperature!). Descending it in the rain was actually fun once we got going-except for how cold it made me. Thankfully I had a cappuccino to warm me up-courtesy of young Jacob who took pity on this cold shlub. It was a fantastic camp. I enjoyed the cycling and the chance to spend time with some wonderful people. I have not been, nor shall I ever be a professional cyclist. I’m 44 years old with a quirky back and a questionable ticker. However, as the Rollfast team cruised the mountains and valleys of North and South Carolina. As we rubbed elbows with world class cyclists. As we refueled on and off the bike with top notch cuisine, this shlub felt like Big George himself…only a little chubbier. Going to a Plant Based diet was never in my plan. Just a year ago, we had a few vegetarians on our team training camp and I made fun of them all weekend long. A few bonked and went home early. I never imagined you could live on just plants alone. Low and behold, I go to Tommy D's camp and come back with new thoughts. I was talking to Tommy D the other day with a question about diet and he simply said "Eat more beets." No scientific reason. No data. No other information... just... Eat. More. Beets. So, I did. And I improved while training in Spain. Like Tommy D, I don't have a real good explanation on what specifically changed for me, but I rode better and recovered faster. The red pigments found in beets are known as betalains, which are antioxidants with anti-inflammatory, antifungal and anticarcinogenic properties. In lab studies, betalains have shown significant promise in fighting pancreatic, lung, colon, prostate, testicular, breast and stomach cancer cells. These potent antioxidants also work to protect the body’s cells from environmental stressors, and help to protect organs and tissues from oxidative damage. Betalains have also been linked to strong detoxification properties, and may aid in flushing various types of toxins from the body. Traditionally, beets have been employed to purify the blood and liver, and the betalains are likely at least partially responsible for this effect. Betalains have also been associated with lowering the risk of birth defects, as well as lowering the risk of cardiovascular disease. In order to preserve the most amount of betalain content in your beets, cook them as little as possible – steaming or roasting until just done does the trick. To preserve the maximum amount of the nutrients and disease-fighting qualities of beets, you can peel raw beets, chop them, and toss them in your juicer. Beet juice has been found to help lower blood pressure, likely as a result of the natural nitrate content. The natural nitrates found in beets convert to nitric oxide in the body, which aids in relaxing blood vessels, improving circulation, and providing energy. Needless to say, all of these effects work to further prevent the risk of heart attack, stroke and heart disease. On top of that, beets are rich in vitamin C, which is crucial for the health of the immune system. It also improves skin health, and reduces inflammation throughout the body, which helps to ward off all sorts of chronic ailments. The fiber content of beets helps to keep your digestive system running smoothly, promotes healthy gut bacteria, stabilizes blood sugar, and may further reduce the risk of digestive-related illnesses such as irritable bowel syndrome (IBS) and even colon cancer. Training in Spain with Thomson Tours is one of the most challenging things I've ever done on the bike.